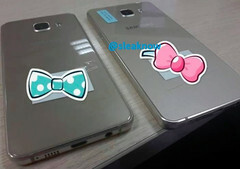 Samsung will update these two mid-rangers soon, improving both their looks and their hardware, claim the latest leaks. Although the updated mid-range handsets Galaxy A5 and Galaxy A3 have been in the rumor mill for a while, Samsung still has to confirm them. Since new images have recently leaked online, and they have been spotted on GFXBench as well, it would not be a surprise to see them unveiled later this month. The models spotted on GFXBench are SM-A510 and SM-A310. The first one is a Galaxy A5 with an octa-core Exynos SoC, 2 GB RAM, 5 MP front camera and 12 MP main camera, as well as a 5.2-inch full HD display. The cheaper Galaxy A3 also has lower specs - 4.7-inch HD display, quad-core Exynos SoC, 1.5 MP RAM, but uses the same pair of cameras. Unlike the matte metal finish of the current Galaxy A5 and Galaxy A3, the updated version use what appears to be a glass back. The fingerprint readers might have been concealed when these photos were taken, but since Samsung plans to bring Samsung Pay to a wider range of devices, adding the technology to mid-range handsets would be a logical move.